I remember, back in 2014, Jessica Simpson was planning a July 4th wedding to Eric Johnson, and it got me thinking: What do you think about couples who schedule a wedding on a holiday? Jessica Simpson said something along the lines of (I'm paraphrasing here): "I used to hate them when I was younger but now I realized it's an extra day to spend with family." My brother translated that to, "I hated them until I decided to do one." Honestly, there are a lot of 4th of July wedding pros and cons. It really all depends on how you look at it. Personally, I think it's hard on your guests. Travel costs around holidays skyrocket, so anyone flying will have to pay a premium. Those same guests get hit again if they're staying in hotels because holiday rates are generally higher than regular rates. And sure, your guests don't have to travel. They can RSVP no. But for the people who want to be there, you need to take them into consideration when you're planning. But holiday-centered weddings lend to some really easy, beautiful, and unique wedding themes. When we were selecting our colors, I picked eggplant, lilac, and silver because purple is my favorite color and lilac and silver are good complements. A July 4th wedding is ready made. You already know your colors will be red, white, and blue, so you might as well have some fun with it. Start your wedding theme off right by letting your guests know that you consciously picked Independence Day to declare your independence from single life and marry your best friend. You don't want people to think you picked the day to save money. Have them think you picked it with purpose (even if the purpose was to save money). 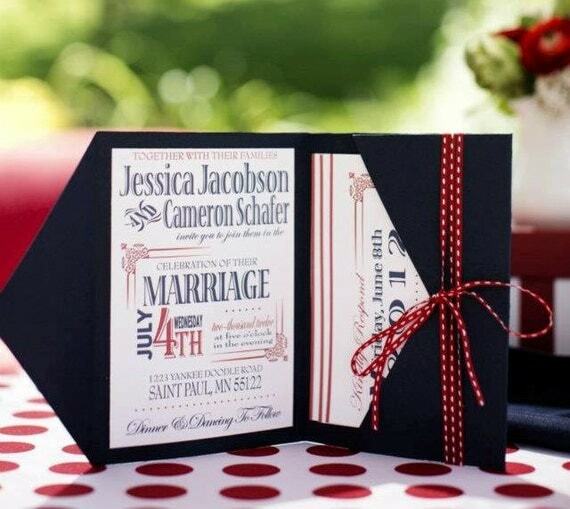 When you send your save the dates or invitations, be sure to incorporate red, white, and blue into them. I say stick with a white dress and add a pop of color with something like blue high heels. You can have your bridesmaids in blue with a red roses bouquet. 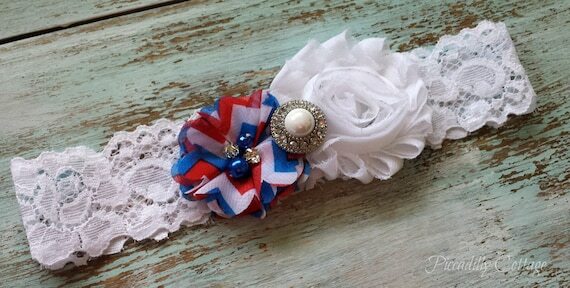 If you want something subtle, you can always add a little red, white, and blue to your garter. As far as venues, I would look for something rustic and very Americana. Think old barns, fields, and farmhouses. When you decorate, you can go as minimal or over the top as you want. I mean, it's America. No one's gonna say you went too far. Consider red, white, and blue paper lanterns, red chairs along white tablecloths, white chairs among red and blue tablecloths, blue napkins ... you definitely have a lot of options for decor. You'll want to create some beautiful July 4th wedding centerpieces as well. You could go a little Americana with mirrored plates with apples and vases with carnations, or just skip the apples and go with red, white, and blue flowers in vases on various sizes. What you could do, too, is paint vases white and then just go with blue and red flowers (since white flowers are generally associated with death here in the US). Finish your decor with a guest book that lends to your theme. 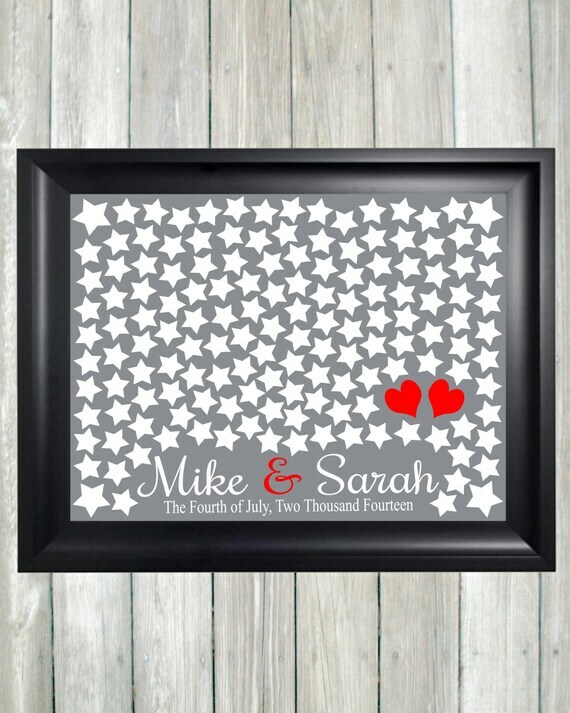 This stars and hearts guest book I found on etsy is perfect. Leave a pen by the print and have each guest sign a star. You and your husband get the hearts, of course. The only thing I would change about it is the ampersand would be blue, not red. This is really cute to display on a wall too. Our guest book was a book and I had intentions of it sitting on our coffee table, but it's sitting in a box somewhere -- and I honestly have no idea where that somewhere is. I should have gone with something to hang. That way, you can enjoy it often. I love cake. Absolutely love it. When I heard the rumor to pick your favorite thing and don't compromise it in your budget, mine was cake (Pete's, if you're wondering, was food and music). I had to have a top of the line cake. It worked out. Everyone loved it. Everyone I talked to admitted to having multiple pieces of it. That's the kind of compliment that makes me happy. So personally, I wouldn't mess with cake. 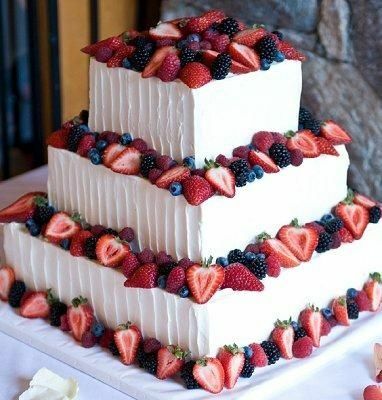 But if you wanted to incorporate your theme, a tiered cake covered in white buttercream icing with sliced strawberries, blueberries, and blackberries on each tier is on the top of my list of 4th of July wedding cakes. Just make sure the fruit is fresh and local to give it an extra kick. And, of course, no 4th of July wedding would be complete without a sparkler send off. The photo below is my absolute favorite sparkler photo of all time. 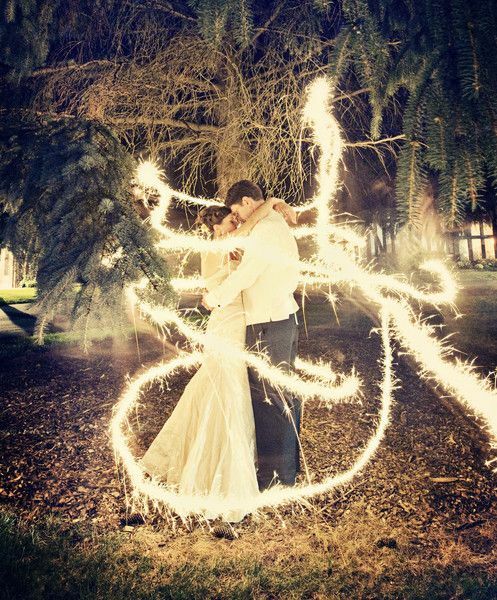 I actually chose our photographers because they had sparkler photos in their example books and I wanted to find a photographer who could do this. And then, at the end of the night, it was nearly impossible to grab people for a sparkler send off because they were having too much fun on the dance floor and enjoying the band (good thing music was one of Pete's priorities because we nailed it). So, it didn't work out for me. But if you are having a July 4th wedding, you absolutely need sparklers. And, to let your guests know that you are having sparklers, you might want to set them up at the front of your venue or at each guest's seat with a small When Sparks Fly sign on them. Plus, as an added bonus, you might get free fireworks. There's a good chance you know where there are fireworks in your area, so try and pick a venue that has a view of those. That's a free perk you pretty much can't get any other time of year. 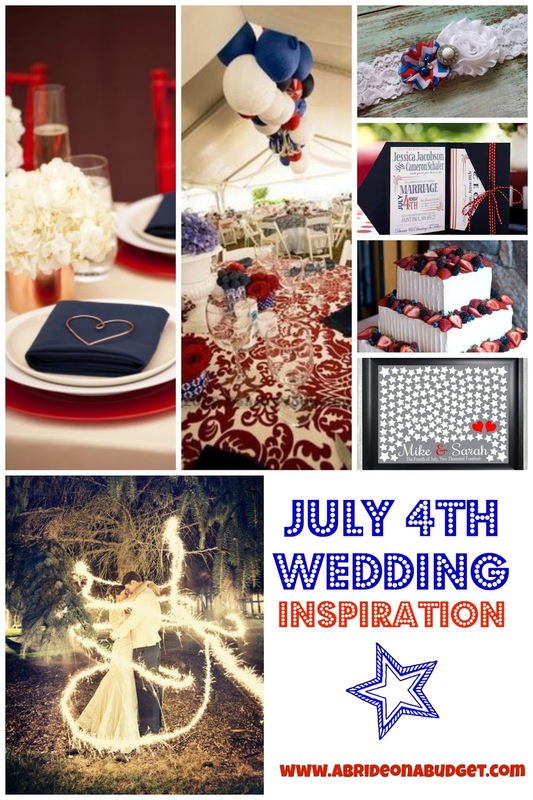 BRIDAL BABBLE: What would you add to a July 4th wedding? Very timely for the day but the advice is good for brides planning a wedding around any holiday. Sharing of course! That is an interesting point which never crossed my mind...weddings on holidays for out of town guests would be higher on them. Love the inspiration! So many cute ideas. And yes, great point about holiday traveling for a wedding. I love the color scheme and all of the things you can do with a wedding on the 4th of July, but it would have to be a somewhat intimate gathering of close friends and family - how could everyone commit to being there? One cool point is that you'll always have fireworks for your anniversary! Love the ideas and garter! Bring up some interesting points. Great ideas for a wedding! I had not thought of one for the 4th~Thanks for linking up to Merry Monday! Pinned! Have a great week!